Clementine | Words. On the Internet. I had an orange yesterday—or at least I think it was an orange. When I peeled it, it was green, which isn’t orange, but I still think it was an orange. 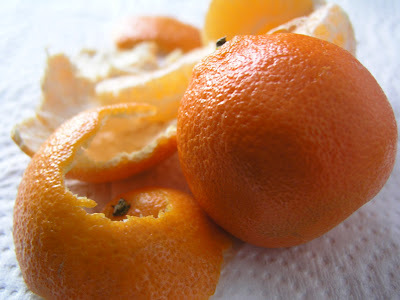 Mom used to tell me they were called clementines, pointing to layerless, jaundiced skin. I called them oranges. She’d buy them in bulk—two or three dozen—and eat six a day, concealing the air with a citrus aroma. She was never hungry for dinner. “I ate,” she’d explain, rolling the fruit across her palm like a ball of raw dough. Sometimes she’d bring one to bed with her and say it was for the morning, but the trashcan never had amber-tinted skin in it, just pale, ivory ribs. “I had a clementine for breakfast” she’d tell me later, eyes darting to the window with disinterest. I didn’t finish my orange yesterday, it was simply too green and there were too many bones.